Vestry is very pleased to announce that the Reverend Christopher Jones is to be our new Priest-in-Charge with a start date iof 1 May with his collation service on 20 May. Tongratulations to everyone who has been so supportive and encouraging during the interregnum. The way we all worked together has been wonderful. All best wishes to everyone for Lent and Easter 2019 from CCD Vestry. 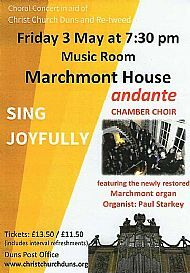 For details of the Concert at Marchmont House on 3 May please click here. The event should be wonderful, in grand surroundings, beautiful music, good company and even with a glass of wine or soft drink and refreshments included in the price! We welcome all who are searching for truth and meaning in life and hope you will feel at home amongst us. We trust you will find others who are also travelling the same road who will be companions along the way. We at Christ Church Duns seek to be a caring people growing in the knowledge and love of God through Jesus Christ and expressing that love, with the help of the Holy Spirit, through our relationships with one another and our service and witness to the community. The church is in the former market town of Duns (population: 2,753 in 2011). Directions. The church is situated in Teindhillgreen on the Preston Road on the north side of Duns on the road to Grantshouse. https://en.wikipedia.org/wiki/Duns [For its location, see Google Maps] Our rectory is nearby. In our rural setting our membership reflects the diversity of traditions and spirituality that is a hallmark of the worldwide Anglican Communion of which we are part. We are held together by recognising in one another the riches that each tradition brings to our church family and the fact that, together, we are all learning what it means to follow Jesus Christ in today's world. A family of caring people growing in the knowledge and love of God through Jesus Christ. Express the love of God with the help of the Holy Spirit through our relationships with one another and our service in the community. Be a church in which all feel welcome. Structure our church for mission and ministry. Make our worship accessible to all and ensure that all have access to worship. Nurture the growth in spirit of all within our circle of influence so that we can all live more effectively as followers of Jesus Christ. Express our unity with the wider church by making sure that we have meaningful relationships with other churches in Berwickshire and with our mission links further afield. 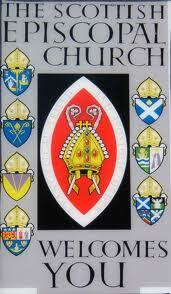 If you wish to become a member of Christ Church Duns you are very welcome so please notify any member of Vestry or the Interim priest in charge. The Reverend Christopher Jones will be installed on Monday 20 May. Further details to come. The new edition of The Communicant is now available on the Diocesan website, via the link below. For the latest edition click here.